Perform advanced editing—Perfect your photos with advanced editing options that give you more control,and learn in-depth techniques with How To guides. Brush away flaws—Easily brush away wrinkles and unwanted objects using the Spot Healing Brush for instant results and the Healing Brush for finer control. Instantly fix common flaws—Fix flaws quickly using automatic correction, and enjoy easy control with sliders, zooming, and before and after views. Get high quality with camera raw and 16-bit support—Work with your digital camera raw data files and use 16-bit image support for smoother, more accurate color and overall great results. 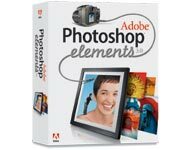 Use industry-leading technology—Create top-quality images with software based on industry-leading Adobe Photoshop. Professionals have relied on it for more than a decade. Artistically enhance photos—Add flair and personality to your photos with artistic special effects, and create fun composites from multiple originals. Give photos extra dimension—Add depth with drop shadows, bevels, glows, and other effects, which are automatically applied to any element placed on a layer. Convert to black-and-white or sepia—Give your photos a classic look by instantly converting them to black-and-white or sepia tone. Apply colored filters—Create real-world photographic effects by applying tint filters that simulate colored lenses on a camera. Simulate painting—Transform your photos with realistic paintbrush effects to simulate oils, watercolors, charcoal, pastels, and different canvas textures. Combine photos with control—Place a friend on a mountaintop or create other eye-catching images with flexible layers that let you control how you combine your photos. Enjoy flexible print options—Make the most of your valuable photo paper by printing high quality pages in any layout you want—individual or multiple photos, different sizes, contact sheets, and labels. Send fast and friendly e-mail—Don’t overload your friends’ mailboxes. Send photos via e-mail that are automatically optimized to download quickly and look great. Post photos on the Web—Show your photos to anyone in the world by creating a Web gallery using customizable templates.